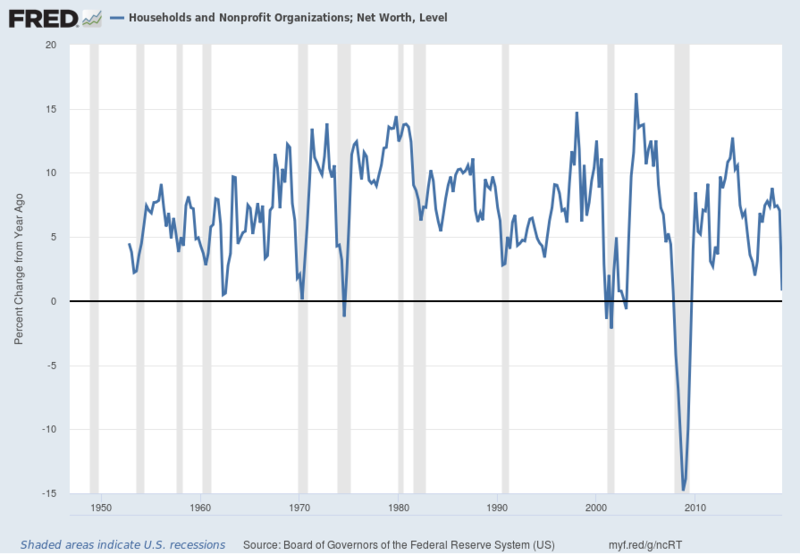 This entry was posted in Uncategorized and tagged household net worth on March 7, 2019 by Ted Kavadas. 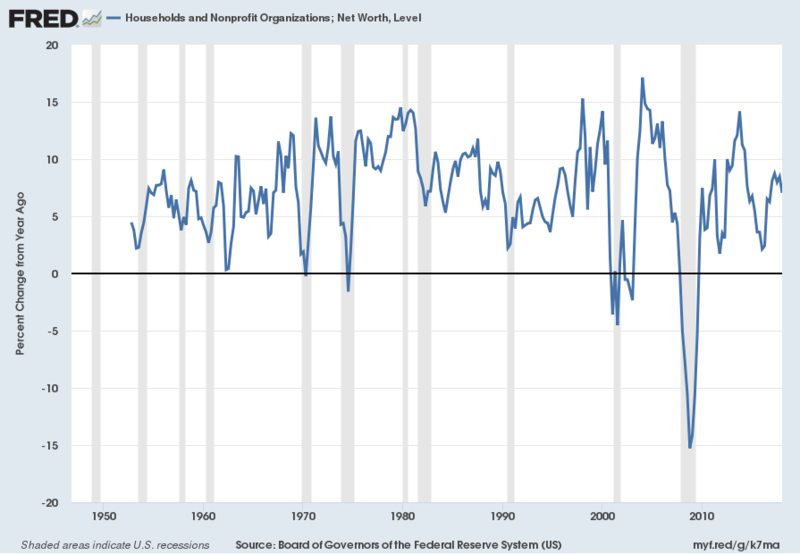 The net worth of households and nonprofits fell to $104.3 trillion during the fourth quarter of 2018. The value of directly and indirectly held corporate equities decreased $4.6 trillion and the value of real estate increased $0.3 trillion. 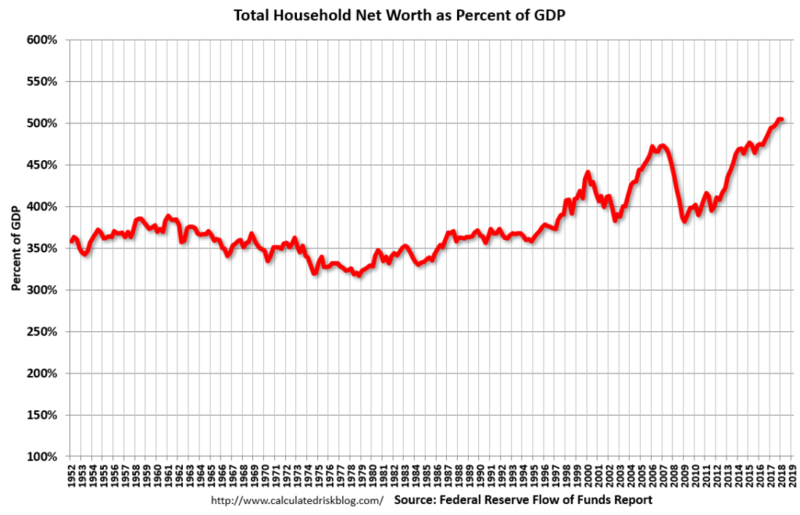 The Fed estimated that the value of household real estate increased to $25.9 trillion in Q4. 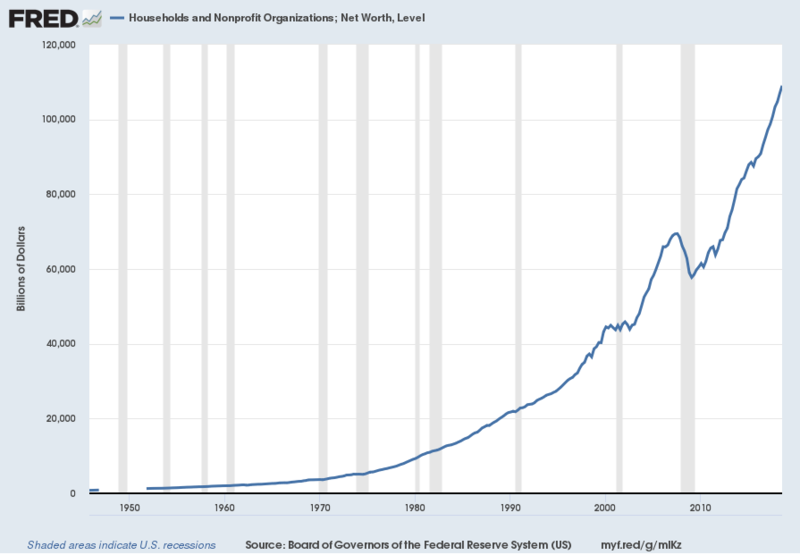 The value of household real estate is now above the bubble peak in early 2006 – but not adjusted for inflation, and this also includes new construction. 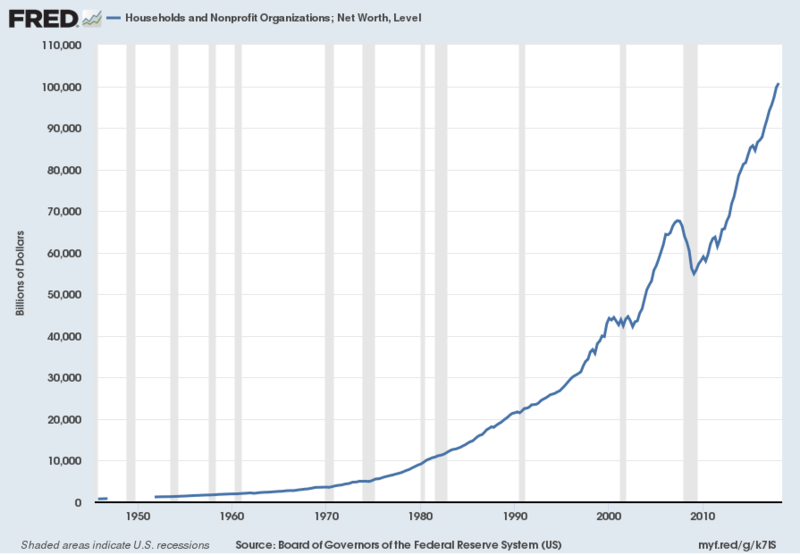 As one can see, the first outsized peak was in 2000, and attained after the stock market bull market / stock market bubbles and economic strength. 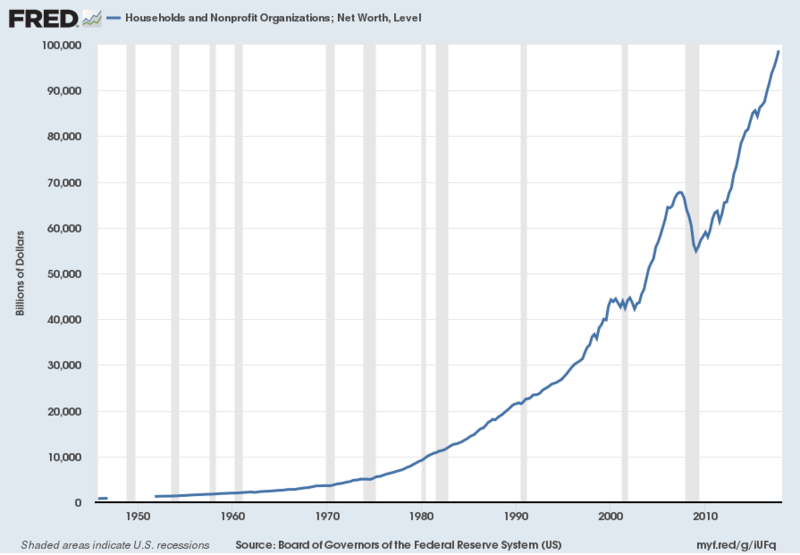 The second outsized peak was in 2007, right near the peak of the housing bubble as well as near the stock market peak. I could extensively write about various interpretations that can be made from this chart. 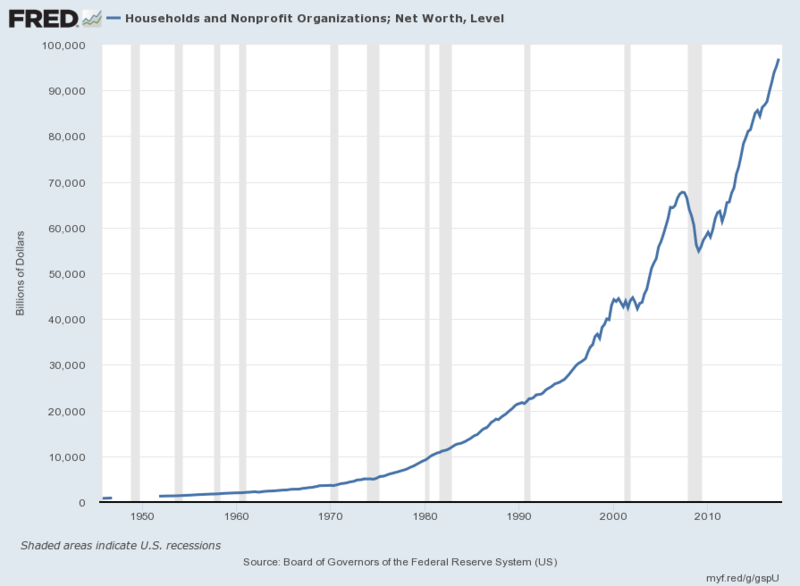 One way this chart can be interpreted is a gauge of “what’s in it for me?” as far as the aggregated wealth citizens are gleaning from economic activity, as measured compared to GDP. This entry was posted in Uncategorized and tagged household net worth on December 7, 2018 by Ted Kavadas. 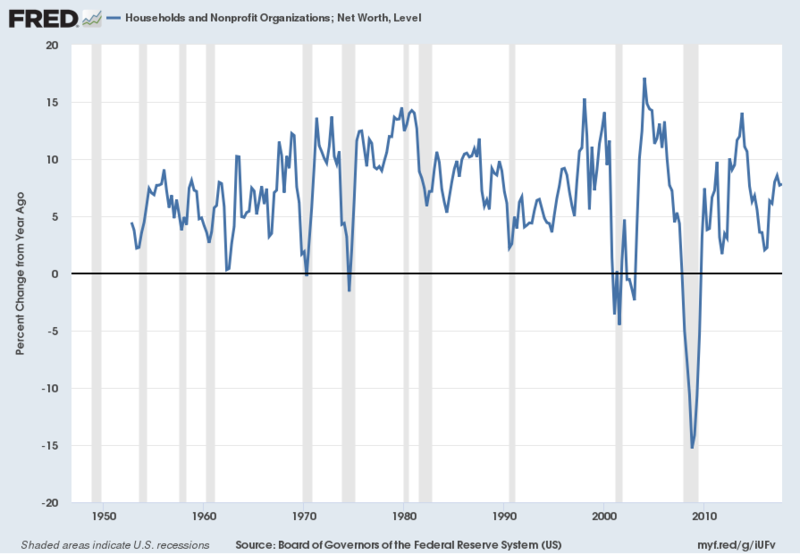 The net worth of households and nonprofits rose to $109.0 trillion during the third quarter of 2018. The value of directly and indirectly held corporate equities increased $1.2 trillion and the value of real estate increased $0.2 trillion. The Fed estimated that the value of household real estate increased to $25.4 trillion in Q3. 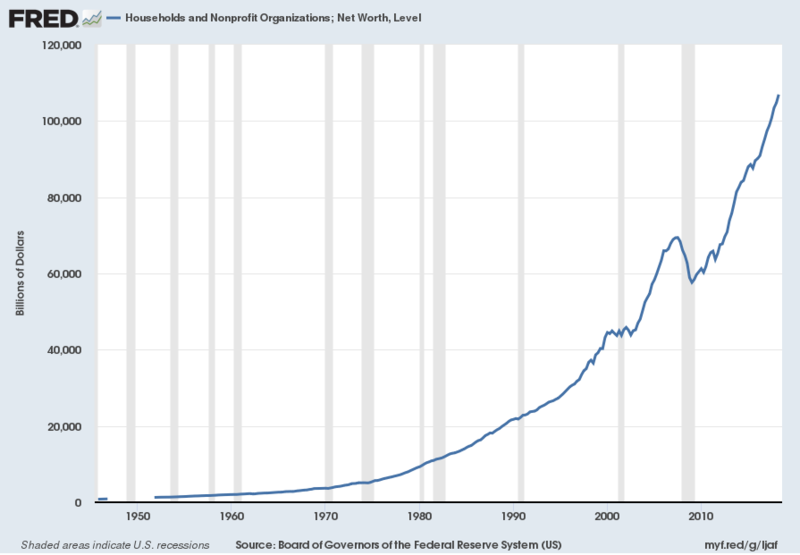 The value of household real estate is now above the bubble peak in early 2006 – but not adjusted for inflation, and this also includes new construction. This entry was posted in Uncategorized and tagged household net worth on December 6, 2018 by Ted Kavadas. This entry was posted in Uncategorized and tagged household net worth on September 21, 2018 by Ted Kavadas. 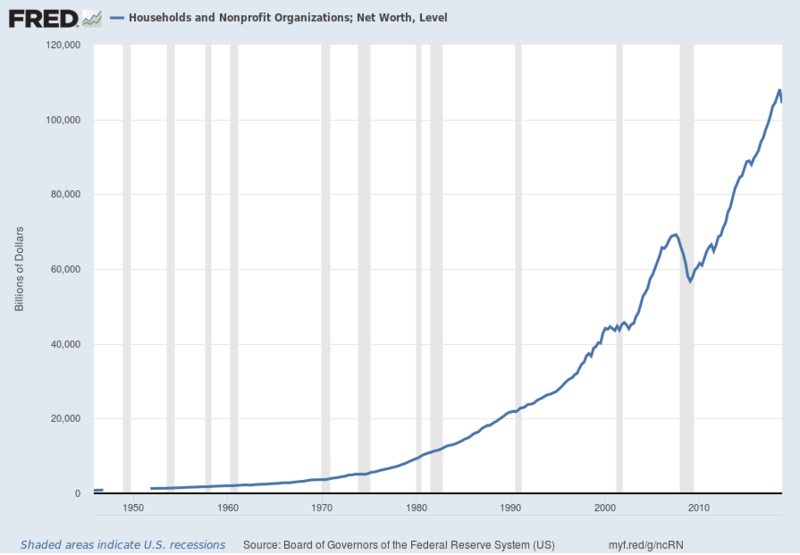 The net worth of households and nonprofits rose to $106.9 trillion during the second quarter of 2018. The value of directly and indirectly held corporate equities increased $0.8 trillion and the value of real estate increased $0.6 trillion. The Fed estimated that the value of household real estate increased to $25.4 trillion in Q2. The value of household real estate is now above the bubble peak in early 2006 – but not adjusted for inflation, and this also includes new construction. This entry was posted in Uncategorized and tagged household net worth on September 20, 2018 by Ted Kavadas. 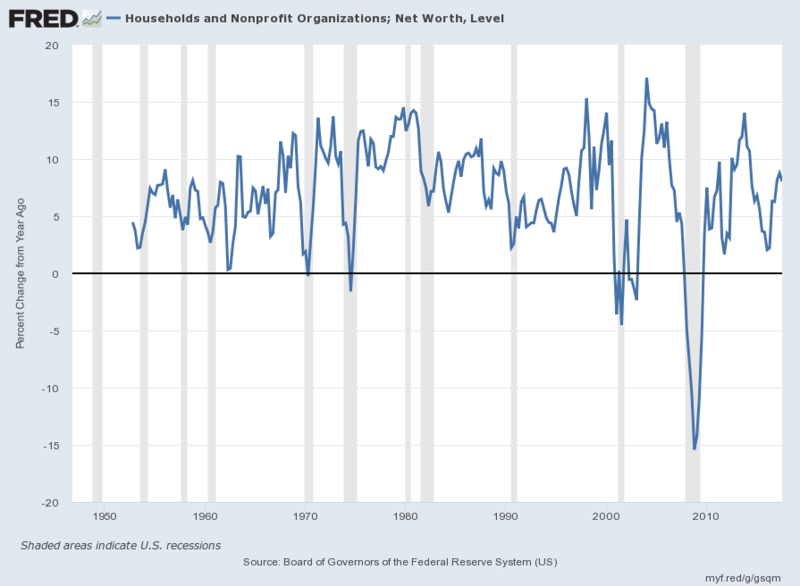 This entry was posted in Uncategorized and tagged household net worth on June 7, 2018 by Ted Kavadas. 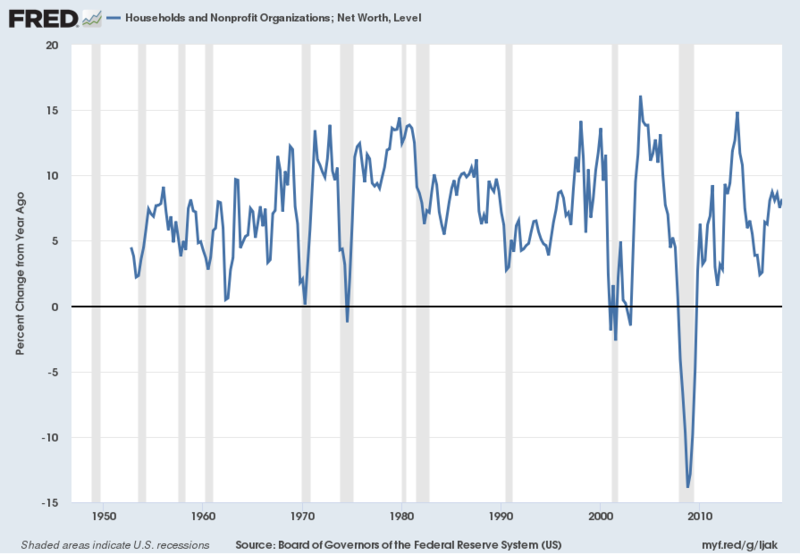 The net worth of households and nonprofits rose to $100.8 trillion during the first quarter of 2018. The value of directly and indirectly held corporate equities decreased $0.4 trillion and the value of real estate increased $0.5 trillion. 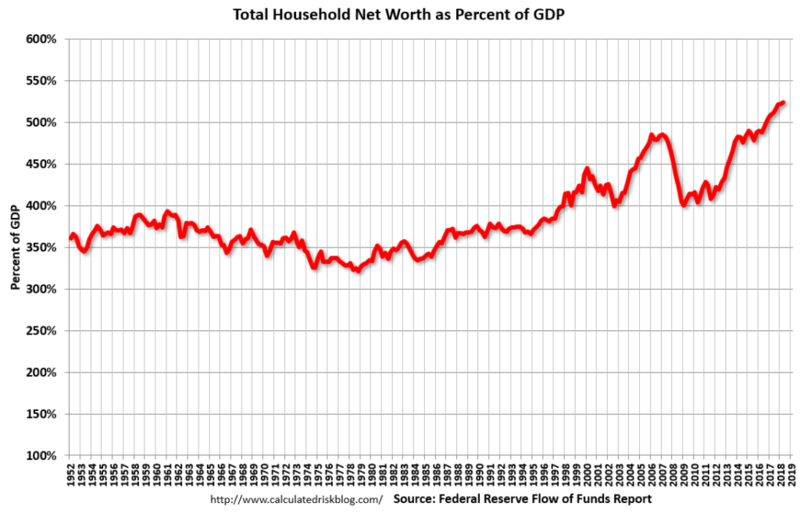 The Fed estimated that the value of household real estate increased to $25.1 trillion in Q1. The value of household real estate is now above the bubble peak in early 2006 – but not adjusted for inflation, and this also includes new construction. This entry was posted in Uncategorized and tagged household net worth on March 9, 2018 by Ted Kavadas. 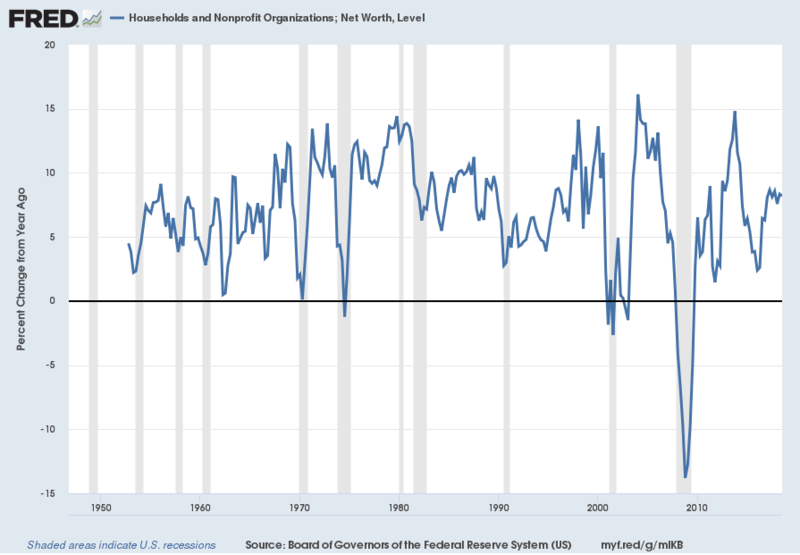 In the last post (“Total Household Net Worth As A Percent Of GDP 3Q 2017“) I displayed a long-term chart depicting Total Household Net Worth as a percentage of GDP. This entry was posted in Uncategorized and tagged household net worth on December 7, 2017 by Ted Kavadas.